“The development of the Internet knows no international boundaries. The sound use, development and governance of the Internet thus calls for closer cooperation,” Xi said in a video message at the start of China’s third World Internet Conference in Wuzhen, in the eastern province of Zhejiang. 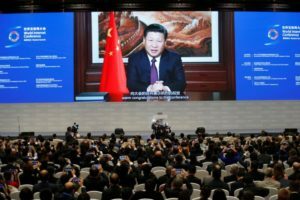 Xi and propaganda chief Liu Yunshan said Beijing was prepared to step up its role in global Internet governance, seeking to rectify “imbalances” in the way standards across cyberspace are set. While Beijing’s influence in global technology has grown, on the homefront the ruling Chinese Communist Party (CCP) has presided over broad efforts to control the flow of information online through the so-called “Great Firewall” of China. Earlier this month, China’s rubber stamp parliament adopted a controversial cybersecurity law that overseas critics say could shut foreign businesses out of various sectors in China. More than 40 international groups and technology organizations have condemned the law, which introduces sweeping surveillance measures and local data storage requirements. “There can’t be national security for one country while there is insecurity in another. (Countries) can’t seek their own so-called ‘absolute security’ while sacrificing the security of another country,” Liu said.